In July I got involved in a project that was commissioned by a Danish health and beauty company called Stylelux. My friend and photographer, Emily Bailey called me in to do make up for an editorial style beauty shoot for one of their face masks. Which was black! So with close up beauty photography in mind, we needed a great model with excellent skin. Emily I have have worked together on shoots lots of times before and what I love about collaborating with her is the fact that we both gel our ideas effortlessly and come out with some wonderful images. It truly is a collaboration when I work with Emily so there was no doubt that it was the right choice when we invited friend, model and muse Pippa Perkins to be the face of our shoot. Before we cracked on with the face mask I wanted to get a few beauty shots in given my love of natural looking make up. Pippa's look is perfect for beauty photography and I really wanted to create a soft, sensual beauty look with natural looking contours and highlights. I created this look by keeping the skin looking fresh and dewy with MAC Face & Body foundation. This is one of my favourite formulas for natural, beauty photography as it photographs really well and doesn't look like the model is wearing make up at all. When a model already has great skin, I don't see the need to put on heavy coverage foundation. I like to let the model's features speak for themselves. And as Pippa already has great skin, I didn't cover it up too much. 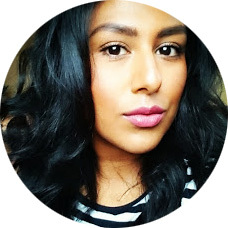 I simply used a touch of Bobbi Brown Pot Rouge in Uber Beige to contour her fantastic cheekbones but sticking to a cream formula, it kept the texture of the skin nice and supple rather than powdery and matte. And then for highlighting which was my main focus for this look, I used MAC Strobe Cream on the top of her cheekbones, down the bridge of her nose and on her cupid's bow and I punched the highlighter out even more by going over this with an almost white coloured, shimmer eyeshadow by The Body Shop in Moonstone. I finished off the look with Shiseido Shimmering Cream Eye Colour in shade WT901 on the eyes and Bobbi Brown High Shimmer Lipgloss in Star on the lips. The final images are stunning. I loved the lighting that Emily used as they make Pippa look really dreamy, soft and romantic. These are definitely some of my favourite beauty images to date. I then had to switch the look up for a more editorial look. The face mask was a black gel texture so with Emily's monochromatic theme in mind I started by completely blanking out Pippa's face. I wanted full coverage so I built up over what base Pippa already had on using Illamasqua Rich Liquid foundation in white covering the lips as well. I slicked her hair back into a tight, clean ponytail and for a it of variation on some of the images I used Kryolan cream pigment in an orange tone on the eyes. These are some of my favourite edits from the shoot. All photography by Emily Bailey click here for her facebook page.